we had a great night last night! our show was a success :) two months worth of hard work and all it took was 30 minutes on stage... but it was well worth it :) and now... i have returned! today i want to thank 3 lovely ladies for passing the above award to me. i've not seen this anywhere before... i think it's a fairly new one. 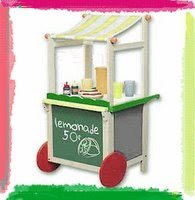 it's called the lemonade award ... for blogs with great attitude and gratitude :) i was so tickled when i received the very same award from 3 different ladies and was itching to write about it but didn't have the time. Hello Luthien. So glad your show was a success, but...I'm glad you are back to crafting. Congratulations on your much deserved awards. And about that plate--gorgeous, gorgeous, gorgeous!! I'm sure your Mother loves it. Take care. You are such a kind soul. Congrats on your award. You deserve many. You are extremely talented and most of all, ever so gentle hearted. You are right, my 2nd blog is very private, so I will decline this award for that blog. However, I thank you so much for your love and friendship. Luthien, I didn't know you were putting on a show... shows how attentive I am. (AV notes to visit blogs more often). Thank you for the Lemonade Award. I guess that's better than a "lemon". Luthien, you are most definitely among the most award-worthy bloggers I know! You never fail to inspire with your art, your words are always heart-felt, and you have a very cool sense of humor! This family plate is soooo very special! Your mom will absolutely LOVE it! And just look at "little you!" How adorable! Your creativity and talents never cease to amaze me. Rock on, my friend! i do know how you are with awards :) still glad i made you smile tho :) and what a coincidence... i came home and checked the mail box and your piece of peace has arrived! i am totally delighted :))) thank you! Congratulations Luthien, I'm so happy for you. 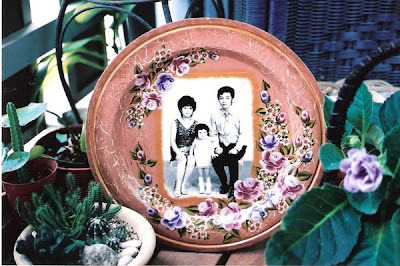 I love the family portrait plate, the florals are beautiful! And what a cool plate you made. I love it.